I'm super excited to share this twice-baked sweet potato Babe Brunch recipe today! There's a large amount of people in the U.S. that "do brunch", and I am one of those people. I love going out to meet friends for brunch, but I think there's something more intimate and memorable about hosting it at someone's home. This recipe cut my cooking efforts in half while getting ready to host my girlfriends. It is easy, healthy, and has all the things we love about brunch in one recipe. All of my amazing BABE girlfriends loved it so I decide to call this one the "babe brunch" recipe. It's 5 ingredients, and only takes a collective hour and a half to prepare an amazing homemade brunch for your babes! Preheat your oven to 400°F. Thoroughly wash & dry 4 large sweet potatoes. Pierce them with a forks several times (5-10 places all around the potato). Then, wrap them in tin foil. Once the oven is preheated, stick the foil-wrapped potatoes onto a lined baking sheet (this is important, as they often leak juices when they bake) and place them inside on a middle of the oven rack. Set a timer for 45-60 mins. (depending on how large the sweet potatoes were. You can always start at 45 mins, then keep baking if they need longer). In the meantime, chop 1 onion and measure 2 cups of washed kale (separated into smaller leaf chunks).Then, heat a large sauté pan on medium heat with about a tablespoon of oil (I used olive oil). Once the pan is hot, sauté the onions until translucent (about 3-5 mins). From there, add the kale and continue to sauté in small batches until it withers enough to allow more kale to be added. 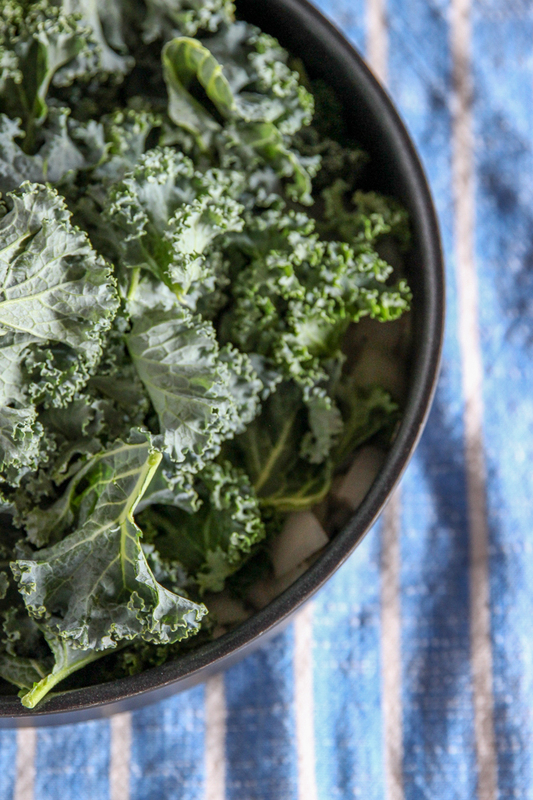 Once the kale & onions are cooked through, scrape them into a large mixing bowl and set aside (cover to keep warm). In the same pan, add a touch more oil (especially if the pan is not non-stick) and scramble 6 eggs. Make sure the pan is still warm on medium heat and add into the pan. Cook the eggs through until they are firm yet fluffy in consistency. You can also add some sea salt and pepper to the eggs while cooking to really bring out the full flavors here. By this point, the sweet potatoes just be almost finished baking. If there is still time remaining and your eggs, kale, & onions are finished cooking, then add the eggs to the covered bowl and keep warm while waiting for the sweet potatoes to finish up. Once the sweet potatoes are done baking, take them out of the oven and allow to cool for 5-8 minutes. In the meantime, you can pull out your 2.5 oz of goat cheese. Carefully unwrap the foil from the sweet potatoes and slice them in half down the middle. From here, make long slices horizontally and vertically (like slicing a birthday cake) through each potato, so that it is easy to scoop out the insides of the potato in nice-sized chunks. Once you've added all the sweet potato meat into the large mixing bowl, fold in approximately 2 oz of goat cheese, mixing all ingredients together. When all ingredients in the bowl are well-mixed, take the sweet potato skin boats and stuff them with the egg, kale, onion, sweet potato mixture. You can heap the potato skin boats pretty full (as in my photo below) and they should hold up fine. If you have any mixture left over after filling each boat as full as you possibly can, then just put the mixture into an oven safe baking dish and continue baking topped with cheese as directed below. Top each potato boat with additional goat cheese and bake for another 15 minutes until the tops are golden and cheese is melty. Let the potatoes cool for about 5 minutes then serve to your babes (or any friends/family members :) )! For the final presentation, I love to add a little freshly-cracked pepper and I always put some hot sauce on the table. *If you do happen to tear a few of the potato skins, no worries! Use an oven-safe dish to put the final sweet potato chunks, eggs, kale, onion + goat cheese mixture in, top with a little more goat cheese, and bake as directed, it will still be amazingly tasty! These also make great left-overs for dinner or a lunch at work the next day. They microwave well to re-heat for about 1.5 minutes at 60% power plus another 30 seconds full power per boat left-over. If you're looking for a unique cocktail to serve with this twice-baked sweet potato babe brunch, try this refreshing cucumber-mint Mojarita, this pretty Paloma, or this nutritious Beet & Basil! I hope you love this recipe as much as I have! If you give it a try, post to social media using #cheersyears - I'd love to SEE! Do you have a go-to brunch recipe? Let me know with a comment below! Here's to easy-yet-DELICIOUS brunch recipes and gatherings with girlfriends... Cheers! 5-Ingredient Carrot Cake Cocktail (V + GF)!